Von Saleski states that the 1918 pictorial issues were first delivered to Liberia on December 12, 1916 but all references lists these as the 1918 pictorials. I know that it is a shot in the dark since these are tough to find used, but does anyone have a pre-1918 cancel for this series? It is hard to imagine that these sat around for a year before they were sold. And with the climate in Liberia, sitting around for a year probably would not be good for them. Thoughts? The info about the date actually comes from the original Perkins Bacon engraving books, see Cockrill's Series Booklet 25, p. 66. 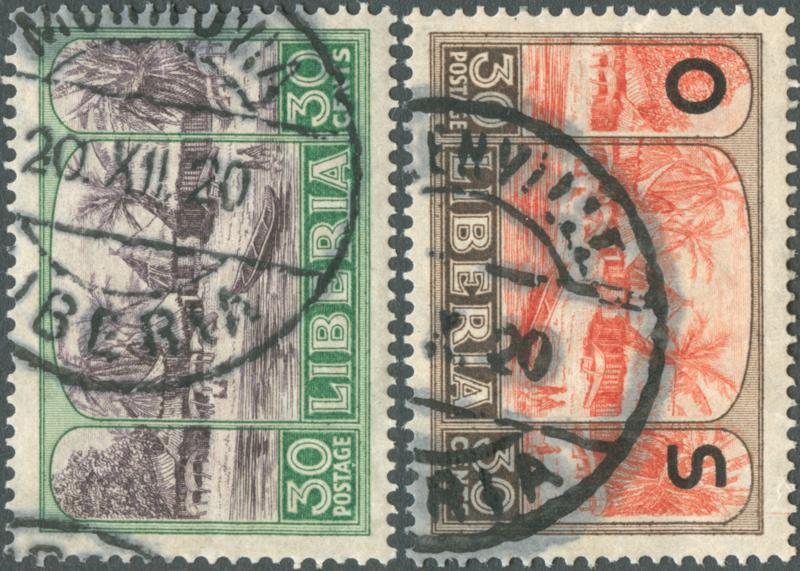 And, I have always wondered the same thing: why would Liberia have waited more than a year before putting the stamps up for sale? I guess one year isn't much of a problem regarding the climate, thinking of the 1909, 1906 and earlier issues overprinted locally during the war. Still, the question remains, why would they wait? I can only imagine that they were still trying to "mulct the collector", as Boy's Life called it. Perhaps the earlier "emergency issues" sold well enough, so they opted for creating another overprint in 1917 instead of issuing the new definitives they already had? And then after that failed, they didn't issue them until early 1918 when they could have issued them 2H 1916. 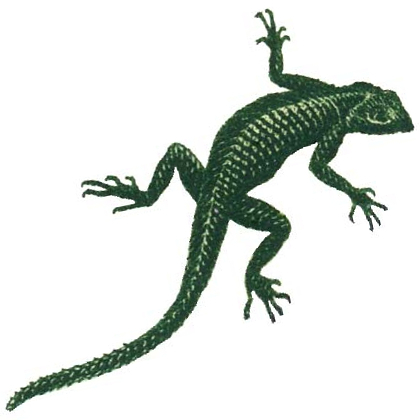 I hate to always blame it on Liberia's budget, but they never seemed to have a lot of money. They seemed ordered stamps virtually every 10-16 months. 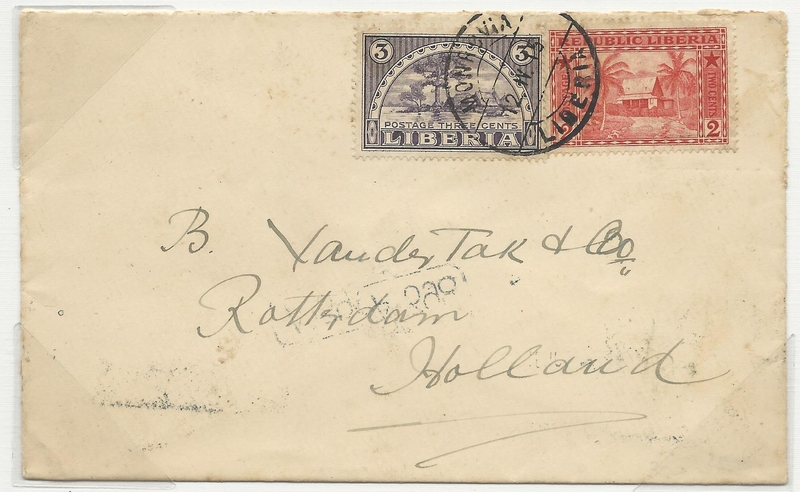 I thought I read somewhere that Liberia even considered just ordering more printings of the 1909 stamps in 1916. Even though there is a note in the PB archives that says the 1918 sheets were actually delivered in 1916, those sheets were from unhardened plates. So they wouldn't have made many sheets. I suspect they were just proofs. The PB "Hardening Book" says the plates were not hardened until 1918. They would never have made a production run on unhardened plates. One has to go back to the early days of the British Penny Black where they made stamps on unhardened plates and they wore out in no time. Back then, they did not understand metallurgy and how to make the right steel chemistry to be hardened at a specific temperature (that they could not measure!). It was pure guess work. Most times they got it wrong, and the plates never hardened, but they used them anyways. That's why so many plates were used to make those stamps... albeit, they made millions of stamps. Liberia rarely seems to order more that 50,000 at a time, and usually much less. But in the PB archives, PB refers to the issue as the 1916 issue. I have a 10c die proof with a 9/3/16 date (9-March)! The only thing that makes any logical sense is that the post office was on a limited budget and the German stamp contract was cheap in 1915. And the Congress/Parliament would not appropriate funds for the PB issue until 1918. So they did a 1917 overprint. I would love to find a cover franked in 1916! Given the German sea blockade of the UK in particular maybe it was easier to trade with Germany! Thanks for this Michel info. Scott lists it as 1915, but I hate to cite them to anything specific. I have a 1915 dated cover I think. I don't think I would call your example CTO. No reason to think it's not legit I would think. I would love my stamp with the 1914 postmark to be postally used, but it has full gum. Since this was issued June 19, 1914, that means Liberia was talking to West in 1913. So, that doesn't seem too unusual now. 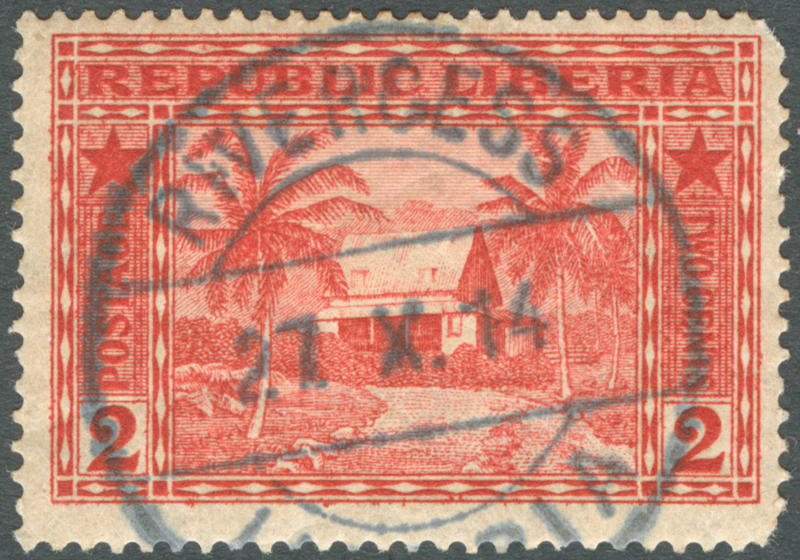 Liberia was talking to both companies about a stamp issue in 1913. It would be interesting to know their reasoning at the time. Eventually both were made... Too bad all the German records no longer exist. I spent a little time sorting out 1918 covers this weekend. One thing struck me as odd is that most of my covers were franked with Official stamps, and generally used in the early/mid-1920s. And they are just normal looking covers, nothing really special (5c, and 1c+2c combos, etc. ), and not official covers. I know in the 19-teens there are a lot of mixed ordinary/official covers and usually philatelic looking, or contrived frankings. But these 1918 issue franked covers struck me as odd. I was just wondering if any one else sees this as well. I was just thinking that maybe Liberia surcharged a disproportionate amount of ordinary stamps, and thus used more official stamps for the original value usages. Even when I was there in the 70s the business sector was quite small so possibly the Government agencies were one of the main postal users and would presumably use Official stamps ?